Burberry Skirt Gets a NeoPixel Makeover #WearableWednesday « Adafruit Industries – Makers, hackers, artists, designers and engineers! Guido Burger has already created a sensing ring with his Pico-Platinchen, a tiny stitchable Arduino compatible microcontroller. Recently he decided to hack a Burberry skirt for MakerFaire Berlin, adding to his growing repertoire of construction techniques. The goal was to make the electronics easy removable, washable, expandable while reducing dramatically the needed power to run the LEDs. He started with a CAD design of a frame to hold the NeoPixel strips, which later translated into seam tape strips. It reminds me of a hoop skirt that would have been worn in the old days under a gown. 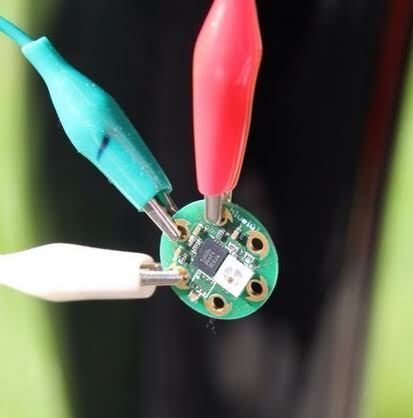 This method definitely makes the electronics easily removable. Guido’s Pico Platinchen allows for the skirt to react to motion with it’s 9 DOF sensor. Normally he operates this controller with a coin cell battery, but for the skirt he decided to use 2-AAA batteries. 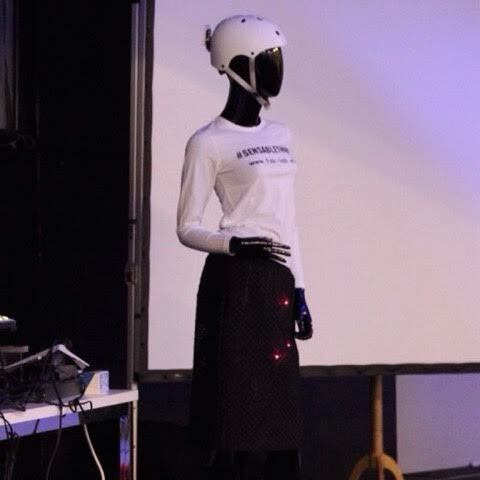 For the final skirt version he added a BLE module so mobile phones or beacons could be sensed. It’s a colorful way to keep track of those around you. Guido likes to name his projects SENSable, and you can see he packs a lot of sensing into a small space. I would also add that sensible is the exact word I would use to describe Guido’s design process. In the finished skirt, the top layer of fabric is a laser-cut repeating circle pattern, which allows light from the NeoPixels to just peek through. Here’s a video of the skirt in action. I’m starting to see more and more laser-cut clothing in mainstream stores, including skirts at Ann Taylor and swimsuits at Target. So, stay alert when you are walking shops as you might just find the perfect potential NeoPixel project. If you are interested in making your own skirt that reacts to motion, you should definitely move on to our Sparkle Skirt guide. It’s fun to glow when you shimmy!